Summary: Asbestos, a naturally-occurring fiber that is fire-resistant and carcinogenic (cancer-causing), was once widely used in construction materials like insulation, cement and roofing. When asbestos is broken apart, its tiny fibers can become airborne before being inhaled and swallowed. Scientists in the U.S. reported its dangers in the 1960s (Germany had reported dangers in the 1930s). However, asbestos continues to be found in many household materials, makeup products and children’s toys. Nearly 3,000 Americans die from asbestos’ lethal effects each year, and its numbers are widely underreported. Lina Reinstein, whose husband died of mesothelioma, a fatal cancer that is caused exclusively by asbestos, in 2006, has fought politicians in Washington, D.C. for a full ban on the use of asbestos. “Progress is glacially slow. I have buried so many people I have known and loved, including my husband,” she said. Key challenges to an asbestos ban include the role industry lobbyists have played in Washington and the Trump administration’s refusal to study or regulate asbestos exposure. More than 60 nations have banned asbestos. 1) Essential question: What are the health and environmental impacts of asbestos? 2) Why does the U.S. continue to import asbestos despite its lethal health impacts? Should they look for alternatives that are less lethal? Explain. What challenges may arise from trying to use other materials? 3) How should lawmakers deal with industry lobbying efforts that support the use of asbestos? What are your views on politicians who have supported asbestos use and non-regulatory action of the material? How does the government treat other toxic materials? 4) Alan Reinstein was exposed to asbestos while doing home renovations. The video covers many other instances in which workers are exposed to the carcinogen in the workplace. 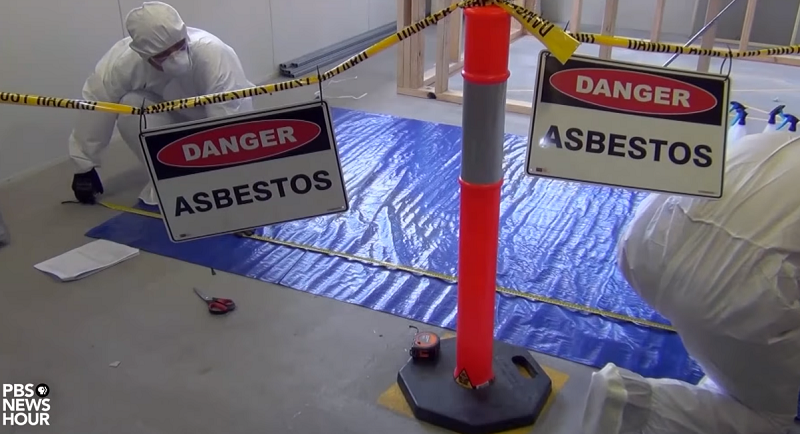 What workplace reforms are necessary for workers to be safe from asbestos exposure? 5) How should industry and government leaders be held accountable for the hazards of asbestos exposure and the thousands who fall victim to it? 6) Media literacy: Do you think business leaders who support the use of asbestos should have played a larger role in this story? Why might they be hesitant to participate in such a story? How could you find out if PBS asked them to be part of this story? 1. What steps can individuals who suffer from mesothelioma and their family members take to seek justice? Does the government have an obligation to provide funding for those exposed to hazardous substances like asbestos? 2. Do you think there should be more scrutiny on asbestos trust funds? Why or why not?